Salesforce integration is available for Leadfeeder Premium and Trial users. All Salesforce editions are supported: Unlimited, Enterprise, Professional and Group. For the Group Edition it is necessary to configure your Salesforce before you begin using the integration. 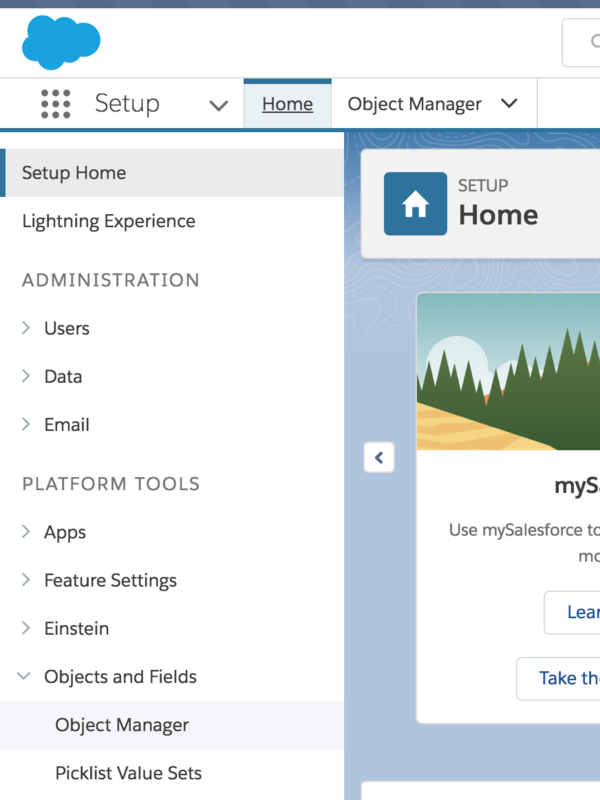 You can find the configuration steps for your Salesforce interface at the end of this article. How do I connect Salesforce with Leadfeeder? 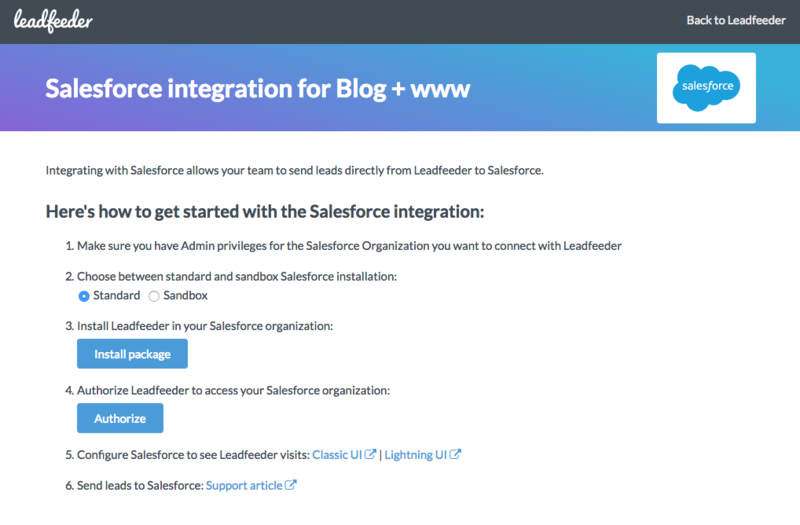 STEP 2: Go to https://integrations.leadfeeder.com. STEP 3: Follow the instructions on the screen. NOTE: When installing the Leadfeeder integration package in Step 3 above, make sure Install for All Users or Install for Specific Profiles. This option determines who within your organization is allowed to see the Leadfeeder visit details that we sync into your Salesforce. Once you have connected your Salesforce organization to Leadfeeder it's time to configure Salesforce a bit. The configuration is really easy and it allows you to see all the information Leadfeeder sends to your Salesforce organization. NOTE: If your Salesforce has the Group Edition you need to do this configuration steps before using the integration. Leadfeeder integration introduces two new fields for Accounts: View in Leadfeeder and Latest Leadfeeder Visit. It also makes a Leadfeeder visits-related list visible. 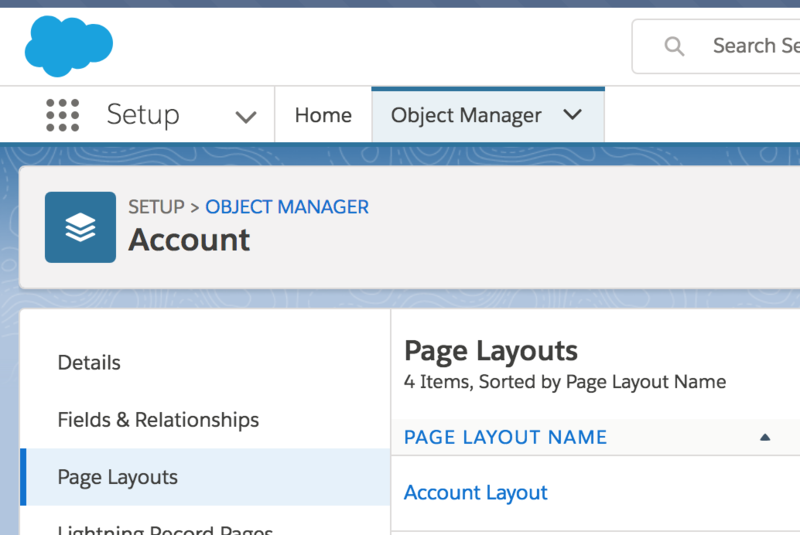 STEP 2: Select Account and click Page layouts. Select a layout from the list and click Edit. If you see multiple layouts you can check which one is in use by clicking Page Layout Assignment. Leadfeeder's integration introduces two new fields for Leads: View in Leadfeeder and Latest Leadfeeder Visit. It also makes a Leadfeeder visits -related list visible. STEP 3: Select Page layouts from the list on the left. Leadfeeder's integration introduces two new fields for Accounts: View in Leadfeeder and Latest Leadfeeder Visit. STEP 3: Select a layout from the list and click Edit. If you see multiple layouts you can check which one is in use by clicking Page Layout Assignment. STEP 4: Click Page Layout from the list on the left. Leadfeeder's integration introduces two new fields for Accounts: View in Leadfeeder and Latest Leadfeeder Visit. It also makes a Leadfeeder visits -related list visible. STEP 1: Go to any Account and click Edit layout. Leadfeeder's integration introduces two new fields for Leads: View in Leadfeeder and Latest Leadfeeder Visit. It also makes a Leadfeeder visits-related list visible. STEP 1: Go to any Lead and click Edit layout. Leadfeeder's integration introduces two new fields for Opportunities: View in Leadfeeder and Latest Leadfeeder Visit. STEP 1: Go to any Opportunity and click Edit layout.